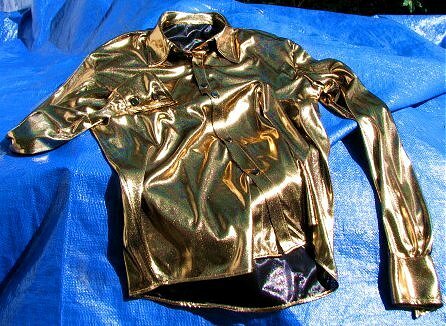 This shirt is a wonderful shade of gold and it is highly reflective. The shirt is made of a thin slinky polyester fabric. The color is the shade of 24k gold jewelry with a bit of black in it. The shiny fabric looks a bit like liquid vinyl or wet paint. The OUTRAGEOUSLY BRIGHT and SHINY shirts are perfect for a 1970's theme party or for performing in a 70s cover band. The shirts should be hand washed after wearing. They do not shrink. I resize every shirt for accuracy and fit. They have rather long arm lengths, but the end can be turned up into cuff. You might want to state your chest size when ordering under the Special Comments section on the order form. Various disco chains and repro Sunglasses are available further down. Men's flashy tinted 70s style aviator sunglasses available for $8.00. This last one measures 41" around total, so it would best fit a 38" chest. The sleeves are quite long at 36". The cuff can be turned up to look more like a French cuff.